Located on 14th street in Manhattan under the High Line, The Woodstock is a recently opened 1960s-themed restaurant and bar designed by set designer Damaris Cozza that features a vivid, retro design and specializes in cocktails and Neapolitan-style pizza. The 4,000-square-foot establishment is divided into two zones: a larger dining area and a smaller-scale lounge, both painted in bright colors. Communal tables fashioned out of repurposed bowling lanes and marble-topped tables occupy the larger hall, with seating comprised of a motley mix of mid-century furniture. 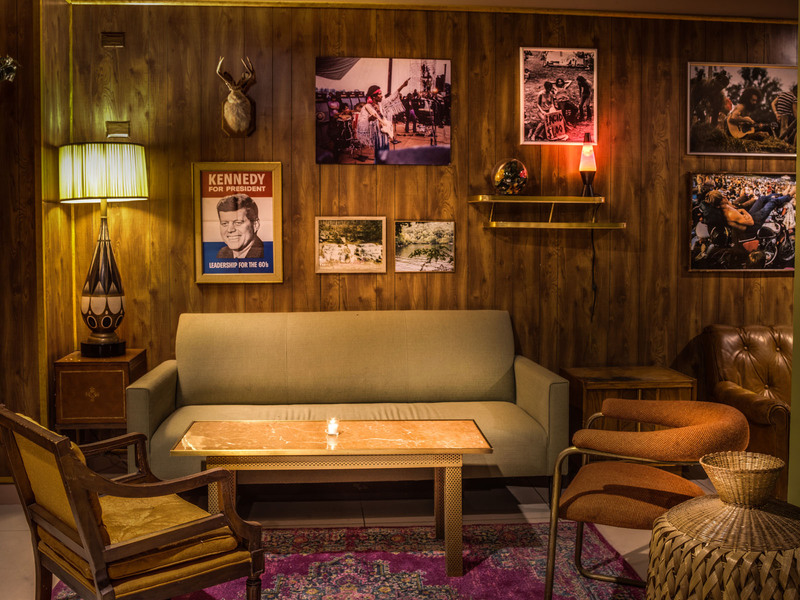 The lounge, clad in wood paneling, has two coffee tables surrounded by plush leather and canvas couches. 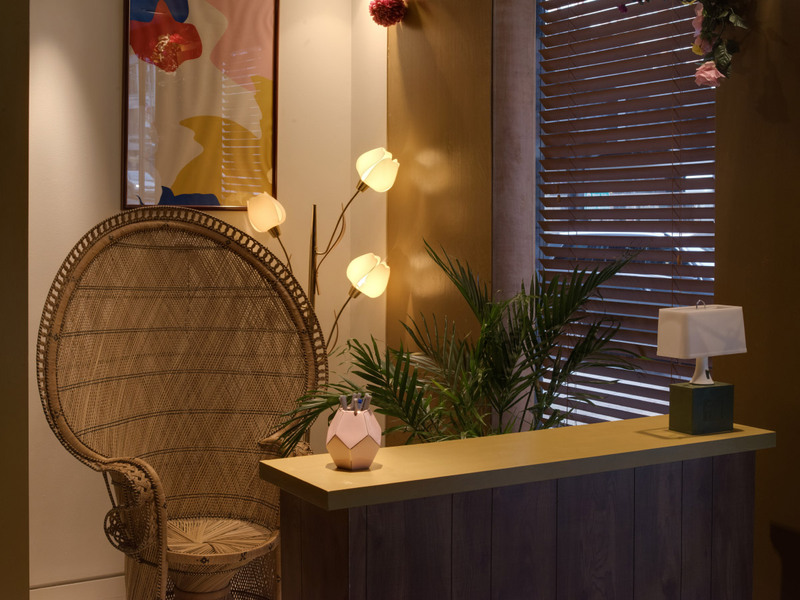 To cement the lounge’s homey personality, lava lamps, antique lamps, and even a stuffed rabbit are scattered across the space. 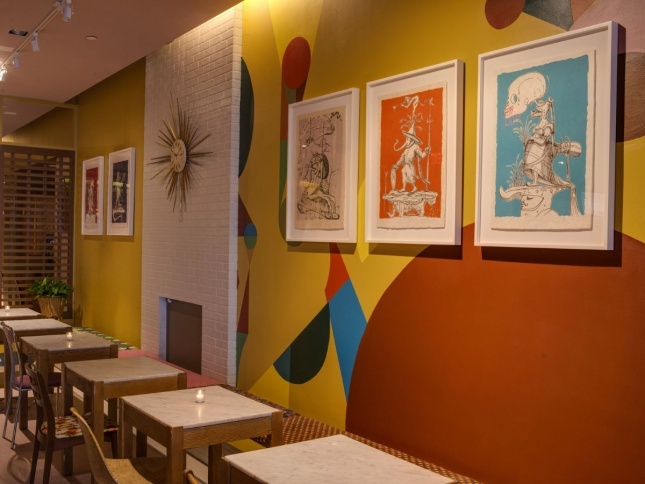 Emphasizing the restaurant’s 1960s vibes are a series of period posters and paintings, ranging from President Kennedy’s campaign ads to psychedelic prints. Of particular note, The Woodstock boasts a rotating set of twenty-four Salvador Dali artworks from owners David Sitt and James Morrissey’s personal collections, as well as a fuchsia felt pool table.